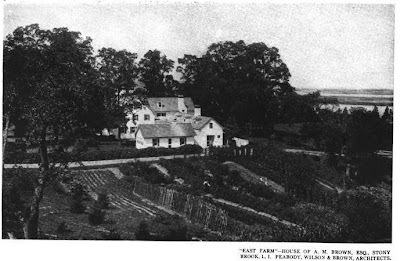 'East Farm', the Archibald Brown estate designed (enlarged) by himself, being of Peabody, Wilson & Brown c. 1914 in Smithtown. Click HERE for more on 'East Farm'. Thanks for the interesting post, Zach. These days Archibald Brown is usually just mentioned as the husband of Eleanor Brown who headed the legendary decorating firm McMillan. Their house in Southampton, "Four Fountains", was later the summer house of Bill Paley of C.B.S. and Babe, his socialite wife. Although it had a 40 x 40 living room with a 20 + ft ceiling, it was a relatively small house. Decorated by Parish- Hadley and located on eight prime acres, I do not know the current status. Last I had seen, Sotheby's advertised it for rent at $125,000 a month.